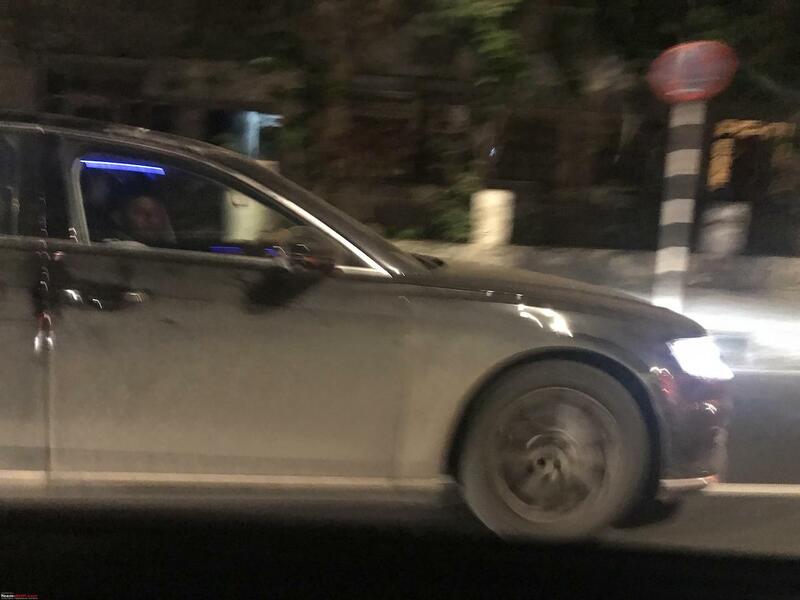 Months after its world premiere at Audi Summit, the 2018 Audi A8 has reached India for local testing. 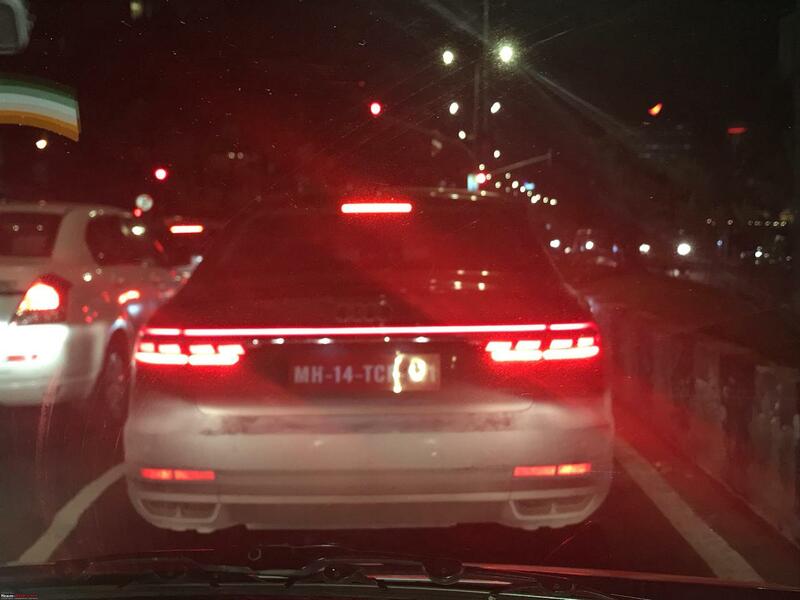 Team-BHP reader Harshil Shah spotted the all-new A8 testing in Mumbai earlier this week. Like the outgoing Audi A8, the all-new Audi A8 may sell exclusively in the long-wheelbase version in India. The 2018 Audi A8 is the fifth generation of Audi’s flagship saloon. Featuring an evolutionary design with hints of the Audi prologue concept, the all-new A8 is bigger, more plush and very futuristic. It still has two wheelbase versions, one standard and one extended. India may get it only in the long-wheelbase version, though. The 2018 Audi A8 L is 5,302 mm long, 1,945 mm wide and 1,485 mm tall. Compared to the previous generation model, it is 37 mm longer, 4 mm narrower and 17 mm higher. Audi has stretched the wheelbase by 6 mm to 3,128 mm. The new generation model’s structure is made up of aluminium, hot-stamped steel, magnesium and carbon-fibre. The new generation Audi A8 is initially available with extensively reengineered V6 biturbo engines: 340 PS 3.0-litre TFSI petrol and 286 PS 3.0-litre TDI diesel. 8-speed tiptronic transmission and Quattro permanent all-wheel drive are standard. Later, 460 PS 4.0-litre TFSI V8 petrol, 585 PS 6.0-litre W12 petrol (A8 L-only) and 435 PS 4.0-litre V8 TDI diesel will follow. All engines have mild-hybrid tech as standard. Also planned for later launch, is an A8 L e-tron Quattro plug-in hybrid with the 3.0-litre TFSI petrol engine and an electric motor developing 449 PS and 700 Nm of torque together. One of the fifth-gen Audi A8’s main highlight is its autonomous driving capabilities. It is the world’s first series-production car to offer Level 3 autonomous driving. The car can drive itself on highways at speeds up to 60 km/h. In slow-moving traffic, the driver can handover the accelerating, steering and braking to Audi AI traffic jam pilot. Then there is the Audi AI remote parking pilot and the Audi AI remote garage pilot, to autonomously steer the car into and out of a parking space or a garage. Other noteworthy features of the 2018 Audi A8 include HD Matrix LED headlights with Audi laser light, 21-inch wheels, OLED rear lights, 12.3-inch Audi virtual cockpit, 10.1-inch infotainment system display, 8.6-inch display for AC and comfort controls and Bang & Olufsen 3D sound system featuring 19 loudspeakers, including a subwoofer and centre loudspeaker and a 16-channel amplifier with a total output of 755 watts. The 2018 A8 L could go on sale in India in the first half of 2018. The 2018 Audi A8 and 2018 Audi A8 L are built are at the Neckarsulm facility in Germany, where their sales will commence in late fall this year. The 2018 A8 L could go on sale in India in the first half of 2018.